Sixteen-year-old Waverly Fishwater believes that people who act suspicious are asking for her to spy on them. When she eavesdrops on one of her dad's clandestine meetings, she learns that mermaids are being abducted. Fearing no one else will save them, Waverly swaps her tail for legs and heads to the site of the disappearances, but it doesn't go as planned. After exposing mermaidkind to humanity, Waverly has to come to terms with leaving the home, friends, and school she loves. For her safety, she must go to a remote boarding school on the California coast. Waverly discovers her new classmates are from a multitude of supernatural species, including werewolves, fairies, and minor Greek gods. But the bigger problem might be all the mermaid-blood loving vampires and the fact that the most infuriating one has taken an interest in her already. If Waverly is to expose the scheme and take out the mastermind, she's going to have to rely on the most dubious kind of help - reckless gods, single-minded werewolves, and virtuous fairies. To avoid a supernatural catastrophe, Waverly must rally this eccentric band of heroes, learning to rely on the help of others in order to stay afloat. Debra Goelz is one of the rare authors who has the rare ability to make me laugh aloud. 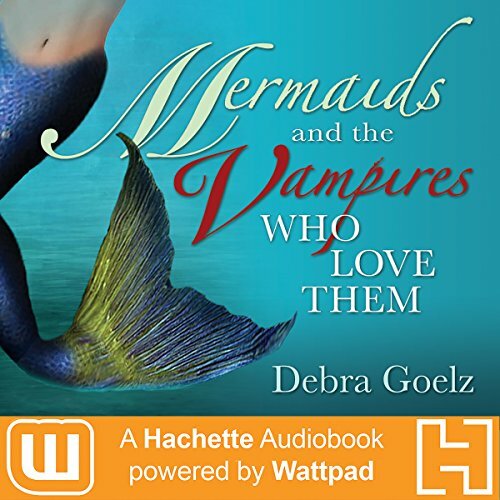 Mermaids and the Vampires who Love them is a story every mermaid lover should listen to. Even if you hate mermaids, you should still listen to it. I had so much fun tagging along with Waverly (and you know she's going to be awesome just by her name alone, am I right?) As she tried to solve the case of who the mernapper is while dealing with Algebra and other fantastical beings. If you enjoy books that transport you into a different world, this is the one to pick up. To compliment the superb writing is Cassandra Morris who did a phenomenal job reading this book. I love it when narrators totally get a character and she did. I totally enjoyed this book and hope...No, I KNOW you will too. I love totally everything about this book! I was one of the first people to read it and I wanted to reread and support the author. I would recommend this book to all my friends and family members and I rated it five stars because it deserves it and the author does too. Ps, let’s not forget the narrator, she was great as well. After sticking her fins where they don’t belong and nearly paying with her life, 16-year-old mermaid, Waverly Fishwater, is forced to say goodbye to her besties and abandon her spot on the octopus wrestling team to attend Saltwater Academy, an out-of-the-way boarding school along the West Coast. Her parents insist it’s for her own good, but Waverly’s convinced they’re out to ruin her life. Her new school is on land (allowing her to switch at will from her tail to a pair of legs) and is attended by an array of diverse creatures — the scariest of which are vampires, who find mermaid blood to be the most delectable snack of all. Knowing this, Waverly still finds herself attracted to a blood-sucking bad boy named Pierce Knightguard, and the two manage to tangle themselves into a complicated yet swoon-worthy relationship. Despite a mostly smooth transition into the student body at Saltwater, something seems fishy to Waverly from the start. And when she uncovers a sinister secret lurking below the surface, her adventure takes on a whole new light. Unable to give up her meddlesome ways, the feisty mermaid enlists the help of new friends — and even some enemies — to try and solve the mystery before it devours everything she loves. Witty, charming and at times dark, author Debra Goelz does a fantastic job of weaving together a story full of unique characters, memorable relationships and an important message. Mermaids and the Vampires Who Love Them will tickle your funny bone, get you thinking and leave you fishing for more! Cute story, my 15 year old niece would love it! I enjoy fantasy they allow you to get away from the norm. I enjoyed the narrator young enthusiastic voice. I first fell in love with this story on Wattpad. I was blown away by the enriched audio version. The author took an already fun and enjoyable story and turned it into a truly excellent experience. I adored the new scenes and I totally fell in love with Pierce and Waverly all over again. I also have to give props to the audio reader. She was exactly how I imagined a teenage mermaid to sound and it's pretty much perfect when she reads the male parts. Mermaids also has quite the age range appeal, since my 5 yr old son listened for hours with rapt attention! I could not possibly love this enchanting book more! The characters are delightful, nuanced, and endearing, while the story is captivating from beginning to end. Goelz has perfected the art of storytelling and Morris brings her words to life in a way that perfectly compliments the writing. Morris embodies the young main character, Waverly. Her enthusiastic and genuine take on Waverly had me rooting for this character and her cohorts. If you are looking for a fun, humorous reading/listening experience, you've come to the right story! I loved this as a book but if you have every wondered if an audio book could be as good as what you &quot;see&quot; in your mind, this is the audio book to get. I still can't get over the perfect casting of Waverly. The performance brings this fun, sweet, timely and hilarious book to life. Thank you Hachette for choosing a delightful tail (pun intended) and pairing it perfectly with the voice. This story is one of my favorites, and the personality that Debra Goelz infuses within this story is a delight from start to finish. Waverly is a somewhat snarky but ultimately lovable and tenacious mer teen who has a penchant for finding trouble and explaining why it's all right. She winds up getting sent off to a special school for supernaturals like herself, which includes the title mentioned vampire. But there's more than just vampires at this school. There are gods and fairies, all of whom are blessed with hilarious and unique personalities. Even those readers/listeners who are tired of vampire stories will enjoy this because the tropes are presented in a fresh and fun way. This book is a quick listen. I love the way that Goelz fills the story with comedy and action while still letting the serious moments sink in. While Waverly has to learn many things, and quite quickly, she is a delightful character, and the characters are ones that I want to spend time with. Beautifully done from start to finish. I can't recommend it enough. I read this story on Wattpad and was dying to hear it and feel how the characters came to life, and I have to say, I wasn't dissapointed at all!! It was a fun audiobook and I loved hearing Weaverly come to life. It made me laugh and swoon so much! If you like sweet comedies, you need to get this! it was an okay book. seemed pretty predictable. i think it would be better if there was a different narrator. i dont regret it. but i wouldnt be bragging i read it either. i like the idea of the story line.